AS the saying goes, there are two sides to every story. First, there is the side that we all see and write poetry about. If we cannot read poetry we read someone else's. It's the beautiful, ethereal side that makes us say 'ooh' and 'aah'. Words like 'innocence', 'purity' and 'freedom' like to associate themselves with this simpler nicer poetic side. Then there is the other side that we write limericks about. It's that side of the story that has all the torrid details of being nasty, silly and ridiculous. It's the side that makes us groan once we see through the veneer. It's called reality. Take for example ,Eid. It's an occasion that has its own little quirks. Let's start from the last day of Ramadan. It's special because the last of anything usually is such as the last exam or the final installment payment for the bike of your dreams. Mostly, the last day of Ramadan is special because it has been a hard long month of abstinence. Smokers had to ask permission in case they offended anyone who was fasting. Food shop owners had to buy huge amounts of cloth to cover up their shops. Shopping plazas needed to put up large spittoons that people really didn't use. It's been a trying time. Moon sighting is like an African safari hunt where you go after big game. Young people especially love to look for the moon. It's more interesting when they climb up on rooftops and look for the moon not up in the sky but up on the next rooftop. It's a brilliant excuse and it has been making the rounds as far back as two decades. It's especially popular in areas like Old Dhaka and Mohammadpur where many of the houses are stuck together like Siamese twins and people can easily move from roof to roof. 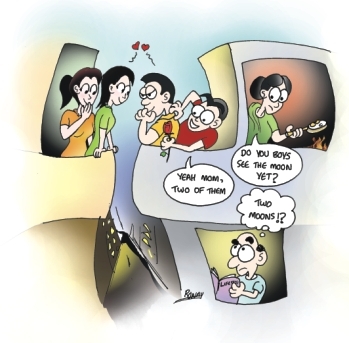 Lamia, an ex-resident of Dhanmondi, had many rooftop crushes until she married one of them. The site of her adventures is now an apartment building where the rooftops are now a bit too high up for such clandestine activities. Shahed, a resident of Lalmatia, met his beau in a similar fashion. The affair continued through a series of meetings on rooftops and balconies till the next Eid when his love met someone else during the next moon sighting. Marriage vows should now include the line 'till moon sighting do us apart'. Cops won't be on duty so they gather their last bit of special "eid bonus" from the motorists and anyone else who might have the slightest criminal element in them. Problem is this eid there might be RAB and that isn't something anybody would like to tangle with. Greeting Eid looking ones best is very important. Salons and parlours do brisk business the night before the big day. Men have been traditionally known to be the closest kin of apes. Nowadays it is all changing as they join the ranks of metro sexual men who at times equal and outdo women in terms of beauty care. The patrons of the neighbourhood saloons generally go in for a quick trim and shave. Gone are the days when heroes needed to be tall, dark and handsome. Dark is definitely out of the question as a few days ago I saw a man in a saloon having a creamy cream applied thickly all over his face. It looked like shaving cream but that made sense if he was having his eyebrows shaved as well. It wasn't a mask either. Closer inspection of the tube revealed that it was "Fuir & Lovely" and no, that isn't a typo. Seems heroes will now become tall, fuir and handsome. The whole concoction was wiped off and cleaned with hot water a few minutes later. Curiosity got the better of me and on inquiry the barber explained that this cream helps to soften the coarse male texture as well as lightening the pigments. Of course, the fact that it was a fake tube of sunscreen didn't seem to matter. Four other saloons in Dhanmondi and Lalmatia were quickly checked out with one offering services for very premium prices. It's a similar story. Boy uses fairness cream, boy meets girl, girl remains fairer and lovelier than boy. The eve of Eid is a special time where concerts take place at every street corner. Tables and stools are set up to display rackety old stereos that render the latest pop number from India, The West and our local Tishma. All these happening beats are accompanied by glum faced young people who sit there waiting for the next track to load. What's music without a little dancing? Last minute shopping is a ritual for many. The logic is that since it is the day before eid, shop owners will likely want to sell off their goods for whatever they can get. So, that means bargains are to be had. But the flip side of the coin is that the shopkeepers also know that the buyers who go at the last minute are desperate to get something in time for showing off in the morning. Best bargains are to be had on panjabis which don't sell much after Eid. The most effective bargain hunters are good poker players who can control their emotions and not let the shopkeepers know how desperate they are. Hindi soap stars won't be any good here, as they love to make all kinds of expressions with their faces. Hasan Imam used to go out with his college buddies and have a rowdy night whether they found any bargains or not. It was more of a night for just hanging out amidst a lot of other late shoppers that had a certain charm of its own. Now that they are all busy with their professional lives, such chand raat shopping is a thing of the past. It's the only time of the year when people willingly hug each other. It' s also a great time of the year for pickpockets. A friendly hug here and a friendly pick there just helps to circulate goods among the needy. Eid day means only one thing and that is to go out and to have fun. It also means to show off what cool clothes you have and the better you show off the more fun you can have. Men have a habit of wearing elaborate panjabis especially if the weather is cool. Otherwise they go for absolutely thin outfits. The thinner the material of the panjabi the more expensive it is. Sounds a lot like what the fairy tale Emperor must have been wearing when he went out naked. Must have been a special thin panjabi that no one could see. It's a period of greed, plain and simple. Children wait for Eid so that they can go around asking for salami or eidi. It's their only source of income and they want to make as much as they can out of it. I know I used to. Little children in many areas especially in ones like Old Dhaka love to get up in their most colourful outfits. They even carry special purses or wallets on this day to collect all their loot. For car lovers Eid is the best time to see all the hot rides in town. Everyone decides to come out with their sports cars, Hummers, Escalades and of course the typical garden snail variety Corollas and Civics with super loud exhausts. A typical scenario is that of four guys in a car with the front seats inclined almost to the horizontal position. A smart deduction would be that their backs hurt from all that fasting. So what do they do? Well, mostly they go in search of girls. They hope that the girls will all converge to a single spot such as an ice cream parlour. As a result all the guys go to these ice cream places. The result is a sea of boys and men. Where are the girls? They are probably sitting at home thinking of how ridiculous the boys are. So if the girls ever want to check out boys then they now know where to go. Pharmacies stay open for no particular reason other than to sell antacids. Couple of pharmacies in Mohammadpur said that pills for headache and nausea sell the most during this time. Antacids outdo all other medications. Packets of saline also sell in large numbers. It seems all that binging right after Eid can have side effects. So all you readers have a happy Eid and remember to stock up on the necessary pills. Note: Any connection to pop stars, cops, people alive or dead or even zombies is purely intentional.